What boost gauges are compatible with the steering column pod? What is the difference between the Podi Mechanical boost gauge and the Stepper Motor boost gauge? For the steering column pods with the standard 2 1/16" (52mm) gauge opening and maximum body depth of 0.8" (20mm) a slim body electronic gauge MUST be used, a regular mechanical gauge WILL NOT FIT as they are too deep. Mechanical boost gauges operate by taking an air sample from the intake manifold, the pressure/vacuum moves a needle that is attached to a spring and that is the movement you see on the dial. There are pulsations in the airstream and these can cause a gauge to buzz/rattle at higher boost levels as the pulses are causing the gauge internals to vibrate. Anti-buzz restrictors are used to help filter out these pulses to try and eliminate the buzz, Podi has designed our own inline version which is made at a medical company due to the tolerance of the opening, other companies have their own solutions. Some gauges are just a bit too sensitive and mo matter what you do will buzz, even though they come from the same batch. Mechanical gauges react faster so if you have a small boost leak you can see the needle flutter. The electronic stepper motor gauges uses a motor to move the needle, not all electronic gauges have a stepper motor. Electronic gauges have a boost sender that takes the same air sample as the mechanical gauge but the sender converts it into an voltage which is then sent to the gauge itself. The gauge interprets this voltage, activates the stepper motor and moves the needle and that is the movement you see on the dial. Due to this signal conversion, and the fact the gauge has to move a geared needle, there is a fraction of a second delay in needle movement. So the sweep of the needle is visually smoother but any slight changes in reading may be filtered out. Electronic gauges do not buzz, however, you may hear the faint whirring of the stepper motor gears if you put your ear close to it. Electronic gauges usually have features mechanical gauges due not, live overboost alarms, peak recalls, etc as they are microprocessor controlled. All orders are shipped FOB Ferndale, WA in the USA. Order tracking: We try to process orders within 4 days of submission and an email confirmation of shipment will be sent to you when your order has been shipped. Please allow up to 7 days to process your order before emailing us for your tracking information. Due to the large number of VEI gauge variations we only keep in stock of the most popular VEI gauges. If a gauge needs to be ordered from VEI to complete your order, we will notify you as soon as possible to inform you of this and of any extra delay in shipping your order. Due to the increasing number of fraudulent claims and credit card chargebacks all orders must be shipped with delivery confirmation. Orders shipped within the USA will be shipped via USPS Priority Mail with delivery confirmation. Estimated delivery time is 3-4 business days from the email confirmation of shipment. Orders shipped to Canada will be shipped using USPS First Class International with delivery confirmation. Estimated delivery time is 10-14 days from the email confirmation of shipment barring any custom delays. All international orders which are shipped to a country not flagged as a Red Zone will be shipped using USPS Express Mail which provides insurance and a tracking number to the provided shipping address. Estimated delivery time is 7-9 business days from the email confirmation of shipment barring any custom delays. 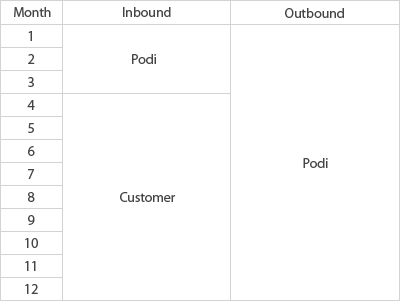 If you wish to have extra handling options (signature confirmation, overnight delivery, etc) or use an alternate carrier (UPS, DHL, FedEx) to ship your order please contact us at sales@podi.ca. Taxes and Duty: The customer is responsible for all import duty and tariffs incurred by their local, state and federal government for international orders. International custom fees: Import duties, taxes and charges are not included in the item price or shipping charges. These charges are the responsibility of the customer. Please check with your country's customs office to determine what these additional costs will be prior to buying. These charges are normally collected by the delivering freight (shipping) company or when you pick the item up – please do not confuse them for additional shipping charges. We are not responsible for these customs fees and cannot reimburse customers for any additional fees charged by your customs agency. Order value declaration: We do not mark merchandise values below value or mark items as "gifts" as US and International government regulations prohibit such behavior. Who pays for shipping for warranty service? During the one year warranty, the following chart explains the responsibilities for shipping. No returned goods will be accepted unless authorized by us and the package is marked clearly with the issued RMA number. If you are unhappy with the goods for any reason, you have the right to return them within 7 days of receipt for a full refund (minus shipping charges). The goods must be returned suitably packaged in new, unused condition and must be received by us within 10 days of issuing a RMA number. As long as these conditions are met we will refund or replace the goods as necessary. Any returns requested after 7 days of receipt or inappropriately packaged will be subject to a 25% re-stocking charge to cover our expenses. If incorrect or faulty goods are supplied, we will of course replace these as quickly as possible. We must receive notification of any problems within 7 days of delivery of your order. 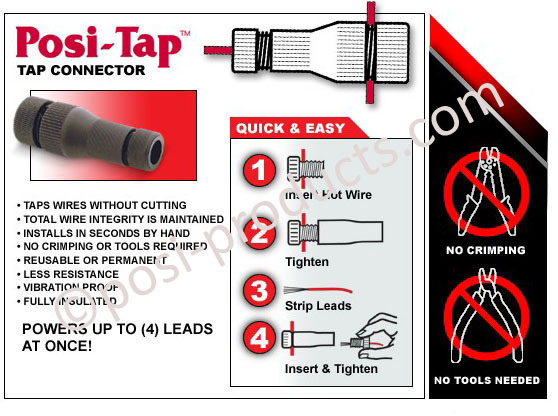 Click here to see how to use a Posi-Tap connector.